Ladies Pintuck Kurta Manufacturers, Wholesaler, Suppliers in Sitapura Industrial Area, Sanganer, Jaipur. 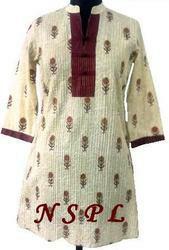 We are a distinguished name in this domain, engaged in offering Cotton Pintuck Kurtis to the clients. Our offered kurtis are finely crafted and thereby widely popular among our lady clients owing to its trendy look and beautiful appearance. It is designed and developed from quality assured fabric materials and comprise of elegant prints. Backed by rich domain expertise, we are engaged in offering Ladies Pintuck Kurta. Our offered kurta is elegantly designed by our skilled designers and craftsmen using optimum quality raw materials to ensure long lasting finish. Owing to its charming look, it is in high demand among our clients.